Fashion, design, and enabling others are just a few of Liz Bartlett's many talents. 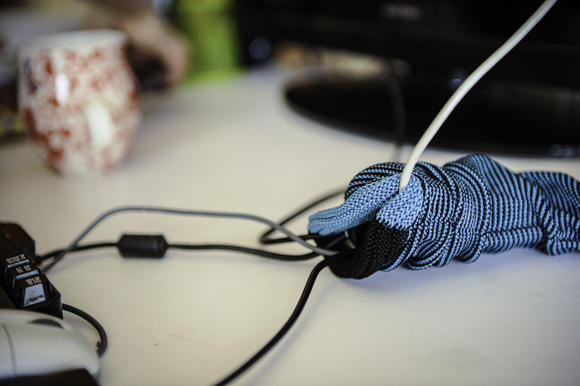 They are combined at KNITit, where solutions are created through electronic knitting. It's not often that old technologies find a way of surpassing the new. Liz Bartlett has found herself at the seam of both. Bartlett and her company, KNITit, specialize in a 3D knitting process that has translated itself into innovation for several different industries. 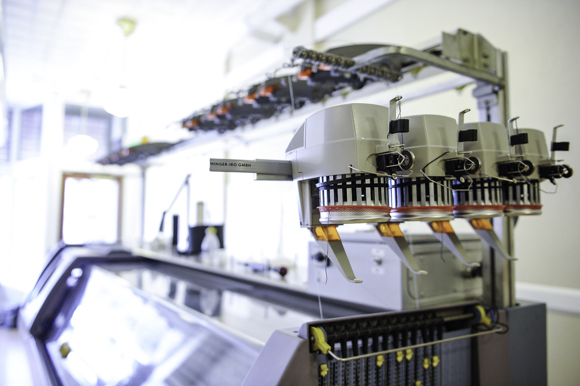 From clothing, to medical garments, to materials for consumer electronics, Bartlett helps clients find solutions through knitting. Her background is in fashion--Bartlett says she wanted to work as a fashion designer from age 11--and while that's a large concentration of her work, there are many other threads involved in the process of what she and KNITit can offer. "There are very few people in the world that do 3D knitting, but those that do all share a common foundation in fashion," she says. At 17, Bartlett was the youngest person ever accepted into the accelerated program at the Fashion Institute of Technology in New York. She completed the program and for her further coursework she chose a knitwear concentration because "it was a more organic way of designing," she says. "It was a very competitive school so I never really felt good at anything until I learned how to knit on a manual knitting machine, and I discovered I had a knack for it." She also discovered Shima Seiki's Wholegarment manufacturing facility in Japan and the Stoll textile facility in Germany, the epicenters of 3D knitting technology. "I studied these machines at school and learned that they were capable of creating whole garments that require no cutting, no sewing, no lacing," she says. "They basically fall out of the machine in one piece. It sounds like a beautiful system with minimal pollution, however it takes a lot of programming and a lot of knit time to get there." During Bartlett's senior year at FIT, she landed a job at a company that Stoll had just bought. She worked with designers from Ralph Lauren and Calvin Klein and honed her skills at manual machine knitting. She stayed in Germany six weeks longer than her eight-month course to get trained on higher levels of programming for the electronic knitting machines before going back to New York and eventually finding a job in Grand Rapids. 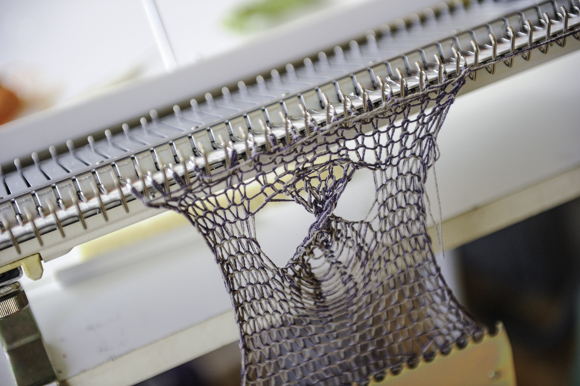 Teknit, a technical knitting mill in Grand Rapids, flew Bartlett to Grand Rapids in hopes of attracting her to a position in 2012. Bartlett says the move was an easy choice to make and she hasn't regretted it since. At Teknit, Bartlett worked under John MacGilbert, who would later go on to become a Senior Knitovator for Nike. "I credit all my skills to having learned them at John's feet. Nike wanted him for years," Bartlett says. MacGilbert's absence left Bartlett with over a year of opportunity to improve her work on her own. "I couldnt use my mentor as a crutch. I had to figure things out for myself," she says. What Bartlett figured out has played well into her expanding reach. Before long she was teaching programs at Kendall College of Art and Design and the University of Michigan, who asked her to plan and deliver an intensive three-week electronic knitting course. She was entertaining job interviews for companies like Nike and Apple, her work now spilling out of fashion into consumer electronics. "I was in this room with lots of giant white marker boards and by the end of the interview I had filled all the walls twice over with lists and diagrams and ideas," Bartlett describes her trip to Cupertino. "I didn't get the job, but I still had this confidence that I could do something more than just office furniture. I had been getting buzz from potential clients that needed linings for prosthetic limbs, compression garments, and I knew there was a need that hadn't been penetrated by the technology yet." She was starting to make waves with her own project, KNITit, seeking public grant money, winning a 5x5 night event, and working with clients on new and innovative products. Before long, KNITit became Bartlett's sole focus. Bartlett has consulted with companies like Soletics and Biacare in helping them perfect their product lines, and is working with EZ Medical Wraps, in Zeeland, designing garments to help those who suffer from lymphedema. The condition, arising from a lymphatic system blockage, results in fluid pooling at the bodies extremeties, typically the feet and hands. The garments Bartlett is helping make will provide compression to those areas when a person is active during the day and allow for easy fluid movement throughout the body at night. Nancy Vee, founder and owner of EZ Medical Wraps, says working with Bartlett isn't just enjoyable, it's energizing. She says Bartlett's dedication and ingenuity is peerless, and her exuberance contagious. "Liz has just been a godsend," Vee says. "She and I are working on some very important products that will help people's lives every day." The fashion industry will be quick to absorb the technology of electronic knitting machines, Bartlett says, and indeed already has, as seen in companies like Uniqlo. In the mean time, that's where Bartlett wants to concentrate her talents. She's always interested in hearing new ideas and knitting them to life, but she's also comfortable relying on a path of slow and steady growth. "When I first started out I had my eyes on knitting everything, but I'm realizing now that I am one person and I have to make choices. Im choosing to go after projects that are going to be lucrative," she says. "I feel like what I have can be an amazing source of jobs in this community. I think I could build a really awesome manufacuring company." Bartlett is expanding KnitIT in 2016 by taking on an intern from Kendall--Alexis Troxell, who has taken all three of Bartlett's classes at Kendall and has an affinity for health care garments and textiles. Bartlett even plans to seek patents for her lymphedema garments. She hopes most of all that KNITit isn't seen as a simple retail outlet, although you can see her equipment and work at 319 S Division, but that she's able to guide clients through the process of electronic knitting and immediate prototyping to create what's right and needed for them. "Anyone can have a product but I can either make it come to life or reinvent it in a way that makes it new," she says. "I have amazing capabilities with my 3D knitting machine, my programming skills and everything else I bring to the table. That's what makes me attractive to the office furniture, automotive, consumer electronics, and health care industries." For more information on Liz Bartlett and KNITit, visit www.knitit.co.